Grand Prize Winner 2 Years in a Row!!! 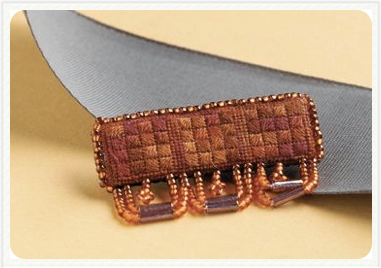 Sharlotte again entered several designs in this year’s PieceWork Magazine Presents The Excellence in Needle Arts Awards—Brooches 2009 contest. She attended the TNNA Trade Show in Columbus in mid-June and was astounded to find that for the second year in a row one of her designs has been chosen as the Grand Prize winner! This contest uses a blind judging format in which the names of the individual makers are not revealed until all judging is complete. This is an amazing honor and is a huge incentive to get more designs done and available to the public. The winning entry is tiny, just 1 1/2” x 1/2”, stitched on 40 count silk gauze with a single strand of DMC’s Color Variations floss, and accented with Mill Hill seed and bugle beads. The July -August issue of PieceWork magazine has the announcement of the winners and photos of the 55 designs that are in the display that was at the TNNA Show and will be at the EGA Headquarters gallery in Louisville, KY though September 23rd. Also see the EGA Blog for more information about this and other brooches on display, as well as other news, information and displays that are of interest to EGA members and other needleworkers. Look for the September/October issue of PieceWork, on newsstands in early September, for the instructions for this pin and a bonus surprise!